Pixar's over-rated comeback looks good only in comparison to its disappointing predecessors, raising the question of whether the company will ever again scale the heights achieved with Toy Story, Wall-E, Up, et al. Inside Out is stunning. Unfortunately, what is stunning is not the film itself but the perceptual phenomenon surrounding it: Pixar Animation's previous troika of Cars 2, Brave, and Monsters University was so abysmally disappointing that, by comparison, the simple mediocrity of Inside Out has fooled critics and audiences into believing that they were seeing a brilliant return to form. I think James Walcott dubbed this the "Bob Dylan Phenomenon": after years of disappointing work, any halfway decent album is hailed as "his best since Blood on the Tracks." In the case of Inside Out, we might call the film Pixar's best since Toy Story 3, but even that comparison would be praise too high; this is definitely second-tier Pixar, more on par with A Bug's Life - another film that had an amusing premise but an unimaginative execution, gilded with gorgeous computer graphics. In case, you haven't heard, most of Inside Out takes place inside the head of Riley, a young girl undergoing a traumatic move to a new home. Well, not really traumatic - more like stressful - but that's not going to stop the emotions living inside her head - Joy, Anger, Sadness, Disgust, and Fear - from turning Riley's relatively prosaic predicament into the premise for a blockbuster movie, including an epic journey replete with insane action sequences. In order to do this, the scenario contrives a set of rules for the way things work inside Riley's head; then of course something goes wrong, and in order to set it right, Joy and Sadness set off to fix the problem. Along the way, lots of stuff happens because the script says so and because we need to fill 90 minutes somehow or other, and eventually we - or at least, Joy - learns a big lesson, which is that Sadness is also important to Riley's mental well-being. Strangely, Joy learns this less through a series of flashbacks to events that should have taught her the lesson years ago; the only reason any of this is a "surprise" to us is that, being flashbacks, the material was previously unseen by the audience. Why what the audience knows should matter to Joy's understanding of Riley's psyche is a mystery the film does not explore. Nor does Inside Out explore why the emotions inside Riley's head have emotions of their own (perhaps in some sort of infinite regression they themselves have emotions living inside their heads?). In any case, their personalities are not as vivid as one would expect from characters so clearly defined by a single trait. The lone exception here is Anger, thanks in large part to the vocal performance of Lewis Black (whose outrage in response to an oddball San Francisco variant on pizza provides the film's biggest laugh). All of this would be neither here nor there if the film had used its conceit to string together some amusing set pieces and comedy, but there is little actual joy in the film. The arbitrary nature of the difficulties faced ruins any genuine suspense (we're in a mental landscape, yet for some reason physical constraints such as Gravity and Momentum must be observed). No doubt the filmmakers were afraid of turning Inside Out into a surreal head trip that might alienate parents taking their children to see it. There are a few moments when the film briefly comes to life, including a very poignant one when Riley's long-forgotten imaginary friend shuffles off into the existential void for good. Other than that, Inside Out is a sadly tedious effort, buoyed only by the craftsmanship employed by the computer-animators, working in 3D to create some beautiful imaginary landscapes that really deserve to have something more interesting happening in them. How Inside Out managed to overcome its rather obvious shortcoming to become both a box office blockbuster and a critical darling is certainly a mystery. My guess is that we're seeing a combination of willful wish fulfillment and cognitive dissonance. In the wake of its disappointing predecessors, to acknowledge the actual quality of Inside Out would be to acknowledge a recent track record indicating that Pixar's Golden Era may be a thing of the past. Well, at least we have The Incredibles 2 looming on the horizon, so there's still hope. 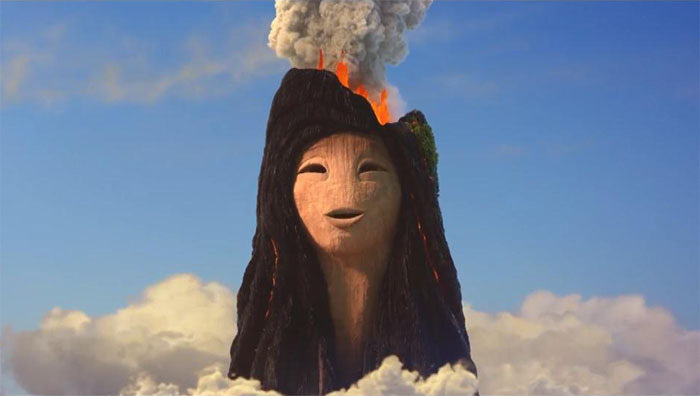 In theatres, Inside Out is preceded by the Pixar short subject Lava, which is about a lonely boy volcano hoping to meet a girl volcano. Essentially a music video, Lava's idea of wit is to substitute the word "lava" for "love" in the lyrics. The result is hokey and cornball, but the attempt to make the girl volcano attractive - even though she has no nose and only slits for eyes and mouth - is bizarre enough to be memorable if not truly pleasant. Inside Out and Lava are currently in release nationwide. Directed by Pete Docter & Ronaldo Del Carmen. Written by Meg LeFauve & Josh Cooley and Peter Docter, with additional dialogue by Amy Poehler & Bill Hader. Voices: Amy Poehler, Phyllis Smith, Richard Kind, Bill Hader, Lewis Black, Mindy Kaling, Kaitlyn DIas, Diane Lane, Kyle MacLachlan, Paula Poundstone, Frank Oz. Rated PG.